It’s summertime! For most of us, summer means frolicking at the beach, trekking to mountain peaks and rediscovering cultural landmarks. There are always more reasons to have fun in the sun! 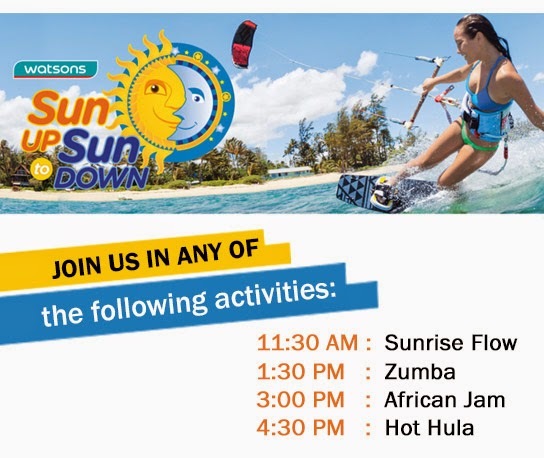 Watsons, the leading health, beauty and lifestyle retailer brand, lets you have that complete summer experience with the campaign: Watsons Sun Up to Sun Down. Whether you’re picking surfing in Bali or La Union, white-water rafting in Kota Kinabalu, shopping in Hong Kong, building sandcastles in Boracay, or strolling in Singapore, always keep your skin protected from Sun Up to Sun Down by dropping by Watsons - your one-stop shop for sun protection. Watsons has a wide range of sunscreen lines to suit every sun-care essential. To add sizzle to the season, join Watsons Sun Up to Sun Down Event presented by Women’s Health and Femalenetwork.com.ph happening on April 9, 2014 in SM Mall of Asia Music Hall. Enjoy Beach Body workouts featuring Sunrise Flow, Zumba, Hot Hula and African Jam, Skin Care Talk, exclusive shirt and more! Log on to www.femalenetwork.com/watsonsph to register.